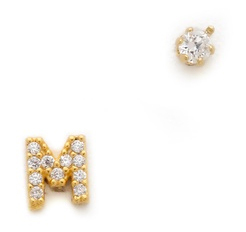 These adorably tiny initial earrings come with a simple round stud and cost $40. So good, right?? I LOVE these. Why didn't they make a "Q"! These are so cute! Are there an H or G? So good!! Just ordered an A;). Thanks again for making my shopping life easier! !